Integrate payments directly into the registration process. We don’t redirect your applicants to a 3rd party payment site. 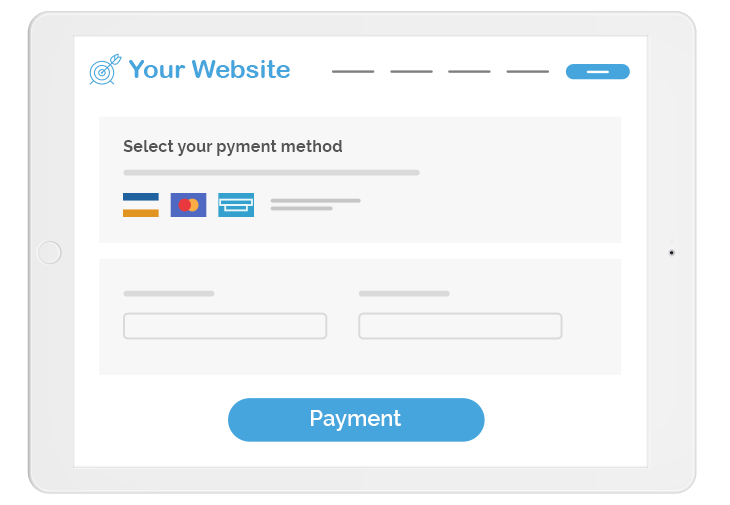 Payments happen within the registration process, right on your website. One of the hardest parts about the new online world is the online world. Downloads, attachments, checks, Paypal. It’s enough to drive you a bit cuckoo. The beauty of Regpack is that with no effort at all you can have one seamless and integrated registration process without pesky redirect pages or combinations of online and downloadable forms. Payments are integrated directly into the registration process. When an applicant completes a form for housing, they can automatically pay for it, when they ordered an extra service, it is added to their cart and they can pay when it is time. This means that applicants can rest easy knowing the features of the project they want are paid for and you can breathe a sigh of relief that at the last minute you are not waiting for payments that applicants aren’t sure they owe in the first place. Our smart registration system triggers applicants for payment information when they answer questions in a certain way. If an applicant opts out of a project feature, they won’t be prompted for payment. If they opt in for an option service, that amount will be synced with their project balance and all future communication will automatically include the addition. Back in the day when registration came in one paper packet in the mail, applicants had to frustratingly search through mounds of paper, required and optional forms and confusing payment balances. With Regpack’s smart system we take care of all the work. Applicants know what services they are getting, how much they cost and are presented with an easy to understand and clear balance, complete with integrated payments. They can choose payment plans, methods and see clearly when payments are due to ensure they get exactly what they want from your project. Regpack’s account managers can help integrate any customized payment system you need. From managing bulk emailing to ensuring you’re nudging your applicants appropriately and providing up-to-date earnings reports, we’ll make sure our system only makes your life easier, not more complicated. Our system is smart because of the people who created it. Our account managers are the best of the best and are here to offer our seasoned advice to make your business run better and smoother. While your users will enjoy a hassle-free and easy registration process, you will also receive the same service from us. Your dedicated and motivated account manager is available to you for as much help and guidance as you may need. Can't recommend Regpack highly enough. I've used Regpacks for over three years and have been impressed by the rapid updates that have made it irreplaceable for our organization. Regpacks has made it easy to set up, embed the site in our website, track and then report on our participants. Learn more about our integrated payment system! Get in touch!